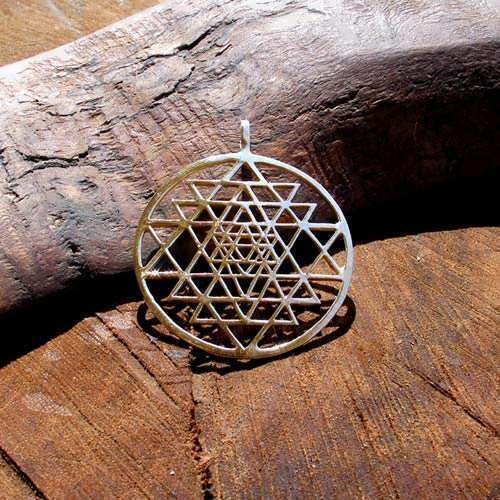 The structure of the Sri Yantra pendant is one that provides abundance, beauty, and balance between male and female and between spiritual and material. Yantra is a mystical Hindu concept that describes a structure or diagram used to balance or focus the consciousness in order to achieve spiritual comprehension. Wearing the Yantra as a pendant or observing a picture of it is intended to endow one with mystical or spiritual abilities. 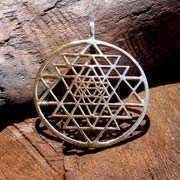 The SriYantra is a structure made of nine triangles tied to each other surrounding a center point called a “Bindu”. This point represents the beginning of creation out of the "Great Void". The use of the number three actually exists in several cultures and the representation of three squared depicts, for several reasons, the power of creation and all creation itself. 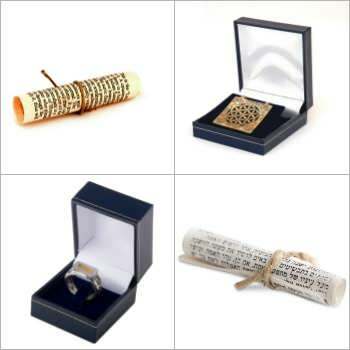 For example, the word God in Hebrew – Elohim – is made up of the words “El” (God), “Elah”(Goddess), and “Elim”(Gods), meaning singular-male, singular-female, and plural. In Hinduism, the structure represents Lakshmi, the entity of abundance in all the worlds, as well as “Triphora Sundary” - the beauty in all three worlds. The four triangles pointing upwards represent “Shiva”, the male force of the universe. The five triangles pointing downwards represent “Shakti”, the female force of the universe. Together the large triangles make up 43 small triangles that represent the “Cosmic Womb” and the “Aduitah” or lack of duality (beyond the illusion perception of good and evil).